Most multimedia developers are familiar with audio timing in frame based applications like Adobe Flash and other movie editing software. They are familiar with the timeline concept and setting events within the timeline. This concept is a little different when using Lectora to sync audio. Lectora allows developers to set events that occur at flagged times within audio. For some, this may actually be a preferred way of syncing events to audio. Audio timings are set with the Lectora audio editor. This editor is built into Lectora. Open up a new blank project and let's look at the steps involved when using Lectora to sync audio. 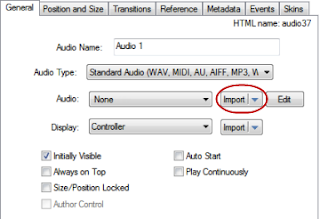 Click Import to add the audio file. This is where you will select the audio you created for the page. 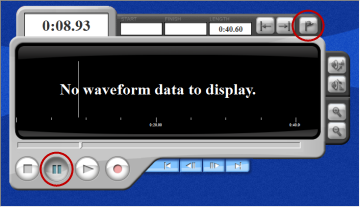 The format of the audio file is important because only Flash Video (FLV) files can be used for syncing events to audio. For example, if you created your audio as a WAV file, you will need to use a program like Adobe Media Encoder to convert it to an FLV file. Once imported, if you want the audio to start automatically for the page, select Auto Start. Now, click Edit to set up audio timings. Setting events to audio is fairly simple at this point. Click the play button to start the audio. When you get to a point where you want to run an event, click the pause button. Once the audio is paused, click the button with the flag icon in the upper right hand corner. The flag button is used to mark the time an event will launch during the audio. In the Update Event dialog, give the event a name that you will recognize from within Lectora. You can also adjust the time in which the event will occur in the audio. Once an event is added, you can go back and edit it at any time by choosing Tools > View Current Events from the audio editor. 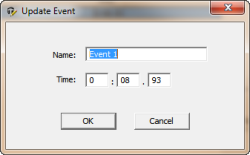 Click Ok to close the event dialog box. Add as many events as you need. Click save and then close the audio editor. Back in Lectora, go to the Events tab in the Audio Properties to assign actions. You will see the events you just added in the audio editor. Choose an action for the events. For testing purposes you can use the Display Message action. Once the events have been assigned actions, run and test the project. 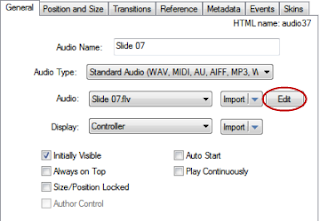 Notice that the Lectora actions occur where they are flagged in the audio editor. This cumbersome, time-consuming method is exactly the reason why I now use Articulate. Anonymous, I do like the sync process in Articulate. But many courses require other features that Lectora offers. Content often dictates which tool to use. One plus about Lectora audio events is that it's very easy to adjust timing of an action later. is the above mentioned method worked on IPad?